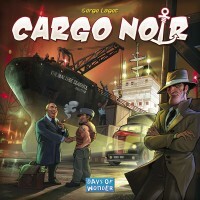 Cargo Noir is a board game published by Days of Wonder that can accommodate 2-5 players. Players bid on goods at various ports in the hopes of collecting sets that they can sell for victory points and special abilities. The components for this game really work well together. The plastic, poker-like chips that represent money work well with the bidding mechanic. It’s a nice touch over using paper money and allows players to quickly see what they need to do if they want to outbid someone. The color plastic ships to represent actions work as well, and easily sit on top of bids to show which player made the currently winning bid. The board is modular, in that it is setup different by the number of players you have playing. I think this could have still be accomplished with a single folding board, but it still works fine and setup is still fast with the individual board pieces. The one thing I might have changed is not using large cards to represent victory points. It ends up taking up a lot of room and most are simply just victory points. Cardboard chits, smaller cards, or poker type chips would have worked just as well and saved a lot of table space on when setting up. But that’s a minor thing and you just need to be mindful of the table space when fanning out the cards for purchase. Bidding – The game does shine as a light bidding game. This mechanic works well. Like I said above, the use of plastic, poker-like chips was a nice touch and makes bidding and sizing up a bid easy. It’s a nice visual with the stack of chips and one of the player’s ships on top. Set Collection – You’re bidding on goods at various ports. Why? Each player has a storage area and a trade conversion mat in front of them. You can only store so many goods, and you can trade in sets of like goods, or sets of differing goods to obtain victory cards, some with special abilities (like more ships – actions, or more warehouse space, etc…). I’ve seen casual gamers struggle a little bit on this, but mostly because they are new to these types of games. Overall, this works well and the player mats help explain the conversion. Scalability – This game does scale well, with the game board that closes/opens various ports depending on the number of players. But to really see it in action I’d recommend more than two players. Around 4-5 some of the resources get a bit limited (like extra warehouse space, etc…) and you need to make some tougher decisions at times. I have played it 2-player and it is enjoyable, but I think it shines better with more. I think this is where a lot of people either love or hate this game. It is billed as a 1950’s noir style game about smuggling goods. It’s really not. The theme is thinly painted on at best. You really don’t get any of the flavor this theme promises. But if you aren’t in it for the theme, this is a great filler game. Personally, I like the game. As someone that participates in a lot of gaming events that aim to teach games to people, this is an easy one for me to add to the list. It’s a great, light, gateway game and a good filler in a night of gaming as well. Again, if you’re looking for the rich theme, keep looking. But if you’re looking for a light, bidding game that you can easily bring casual gamers in with; this will do it! I have played this game several times, and own it. Background: Gather cargo, spend it on ships, special cards (“Syndicate”), etc. get money. Bid on ports (where there is a certain type of cargo.) You can only hold so much cargo (space), so you need to think ahead/horde/compete. This is a good bidding game that does not require a lot of complex thinking. It is neither silly/easy to play, nor so complicated that you need to run through it several times to figure it out. So, it’s a good game to occupy an hour or more. Furthermore, if you’re a decent player, playing against other competent players, it is very difficult for someone to run away with it. It’s very competitive, and can have several players in the hunt until the very end. I picked this game up at Gen Con this year and I have played it several times with different groups and everybody enjoys it. It is an easy game to pick up and play and it gets very competitive when trying to outbid each other for goods in the ports. The Black Market is another pretty cool idea to the game. You can either trade one of our goods for another type available in the Black Market or you can draw a random good from the bag. This game scales very easily and very well from 2-5 players. I have enjoyed it every time I have played. 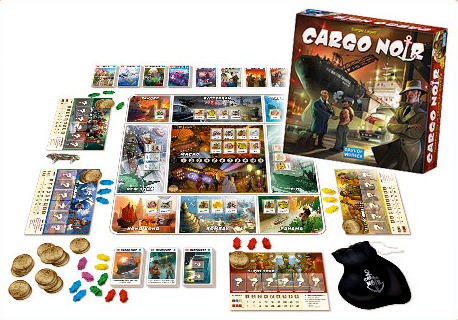 The components to the game are very good quality, especially the game boards that flip over to accommodate the number of players as well as your cargo ships and especially the coins. I would highly recommend this game to anyone who wants a fun bidding strategy game that plays well with only 2 players or up to 5. Add a Review for "Cargo Noir"